This page is not finished yet! Total header size for WLD/SWD files is 2352 bytes. Total header size for WORLD###.DAT files is 14 bytes or 18 bytes. 23(WLD) Title Unused bytes filled with NULL. Map Editor (S2EDIT.EXE) saves only 17 bytes long titles, but preserves longer titles! 19 bytes is maximum for SWD maps. Unlimited Play mode uses this Width & Height information. Long title prevents loading the map. 23 bytes is maximum for WLD maps. Width & Height information is not read when loading campaign missions. 1 NULL NULL terminator for Title. Height This information is not read by Campaign mission loader & Map Editor, but is read by Unlimited Play loader. Safe to ignore in WLD maps. 2 = Winter Selects which palette & terrain textures to use. 1 – 7 = SWD 0 is allowed for WLD, Unlimited Play accepts any value above 0 and trusts the player count from 1 to 6. Return to the Roots supports more than 7 players, in which case HQ locations for those players must be read from object index block. 19 Author Map creator or owner. Unused bytes filled with NULL. 1 NULL Null terminator for Author. 14 HQ X position Horizontal position of each player’s headquarters as a 16-bit value (2 bytes each = 7 total). 14 HQ Y position Vertical position of each player’s headquarters. Any non-zero value means the map is unplayable in Unlimited Play. 11 = Mnga Tscha Each byte represents one player. This information seems to be only used by World Campaign. I suspect Blue Byte has an in-house Map Editor that was developed further than the version released to consumers. 11 27 Map file identification. WORLD###.DAT files start with this information! 00 00 00 00 Unused in WORLD_V1.0 maps, must be NULL. WORLD###.DAT files may have FF FF FF FF before this information, forcing short block headers. Short block header is NOT supported in WLD/SWD files! 01 00 Unknown; maybe multiplier for amount of map data, but is always 1. 2 Width Map width, the one that is actually being used by map loaders. 2 Height Map height, the one that is actually being used by map loaders. After this the actual map data blocks follow. There is a total of 14 map data blocks. Each block = 16 bytes header + Width * Height of actual map data. These blocks are not identified in any means other than their order of appearance in the file. Each block starts with this header and it is exactly the same for each block. There are two versions: long version used by nearly all maps, and short version that is only used by some rare WORLD###.DAT maps. 10 27 Map data identification. 00 00 00 00 Always NULL. 4 Length Size of map data, always Width * Height. This is also the “short block header” that may appear in WORLD###.DAT maps. After reading the actual map file header you simply create a check variable to compare against block header and make sure it is a match. There is no reason to make reading “dynamic” as there is no map that contains varying information. Original WLD mission maps base level = 0. New WLD maps base level = 40. Map Editor SWD maps base level = 10. Maximum value = 60. Greatest allowed height difference from point to point (in Map Editor) = 5. You can have a bigger difference, but building a road etc. near it may cause a crash. It may also make the map partially unplayable. This is the graphical triangle with it’s top corner pointing to the X & Y of other map data locations. NOTE! Textures may have bits 0x40 or 0x80 set active. 0x40 = harbor site textures, the meaning of 0x80 is currently unknown. Value 17 is probably best for totally bizarre levels. The only terrain tiles that draw a shaded edge against it are Mountain Meadow and Desert #2, so that is a limitation. This texture is represented by a single pixel in TEX5.LBM, TEX6.LBM & TEX7.LBM (at 0 x 254). Values 20 – 22 are three textures that locate at the bottom of the texture bitmap. These are unused and appear as magenta on the map, but display in lava color in map preview. No gouraud shading is applied to this texture. Value 21 has desert edge. Values 23 and above are invalid/unusable textures except for 34 which is usable as a mountain spot where one can build buildings. This is the graphical triangle with it’s left top corner pointing to the X & Y of other map data locations. The value here tells the object’s index or quantity. The next block defines the context. Trees are animated in the game. Each tree is assigned a random value so that all trees do not animate at the same position at the same time (thus avoiding a “wave effect” where all trees move the same way). The rest are just object indexes for decorative landscape objects. This defines what the index value in block 5 means. Exists with all except headquarters icon. WORLD###.DAT files fill empty area with FF. This crashes Map Editor. Block 8: Unknown / Internal? / Savegame? WLD/SWD files contain hex 00. WORLD###.DAT files fill this with FF. This crashes Map Editor. Missing from this list: harbor, coast flag? 808Bitflag for occupied / near occupied terrain ? Water, swamp & granite allow flag 9 around point 78. Lava & snow do not allow this, instead any point close to snow/lava is 78. Block 10: Unknown / Internal? / Savegame? 1 = location where Map Editor’s cursor was pointed at when saving the map. Otherwise empty. Water is always there, Fish is removed once consumed, and then Coal, Gold, Iron & Granite quantities. Smallest value for mining resources = none available anymore. Map Editor always recalculates this information based on map data #1 (height map). Game instead trusts the file. This information must be correct or the map appears “flat” in the game. The GOU5.DAT, GOU6.DAT and GOU7.DAT files include a gouraud color map for shading with this map data. You can use information from map data #2 or #3 to link it with this map, getting then a nicely colored picture. The values here range from 0 to 128. The color index is either hardcoded (water, lava, steppe) or taken from TEX#.LBM position 16 x 0 for each of the 48 x 48 sized textures. The table shows the location in the whole texture file. In the above table the Greenland/Wasteland/Winter value is the X position in gouraud color map. 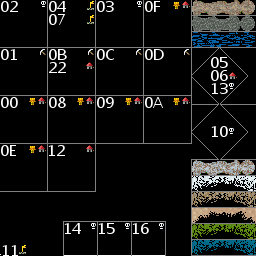 You get the Y position from the map data #13. The index value can come from map data #2 or #3. In the image to the left you can see one white point and four grey points. White point is the point we are calculating the shading value for. The grey points are the relative points we also use to calculate the shading for the white point. From top to bottom, left to right, we can call these point 1, point 2, point 3 & point 4. Indexed passable areas (0 to 249). These locations are referred to in the file header. Index 254 is reserved for impassable areas (snow, swamps, lava etc.). Header does not refer to these areas. The file always ends with hex FF. After the final map data the file may contain a list of animals and their position, replicating the information in one of the map data blocks in a different format. Each of these list items is 7 bytes long. The only difference to the map data block is that it is allowed to have the same location covered multiple times, so you can have more than one animal starting from each location. 1 Animal. See map data 7 table above. Island of Hills (MAPS3\OMAP00.WLD) provided in The Settlers II: Gold Edition DEMO lets you build houses on water. Yeah, it’s cool! Water texture index 6 is being used instead of index 5. This information is largely figured out by myself (Merri / Vesa Piittinen). Farm field information by Jürgen Nagel. Additional information on textures, shading calculation and building sites calculation by Xaser (WLD_reference.txt). Some minor details may have come from other sources. Hi Merri, i like your file format overviews, it looks great because you used the texture-graphics. I really enjoyed reading this 🙂 and i will save a copy of this :-). One question: You didn’t listed some objects of Block 5. I haven’t listed them because I haven’t gone through the objects yet 🙂 The current list is based on Xaser’s old documentation so it isn’t complete. Anyway, collecting or sharing any information that is still missing is welcome, so thank you for these! It’s a little bit less work for me to do. I eventually try to list the items with graphics. 17 Gate(active)/Tor(aktiv) – RttR doesn’t know! 00 Wheatfield(Block 6 “D1)/Getreidefeld (Bereich 6 “D1”) – RttR doesn’t know! 16 Burning building(block 6 “DC”)/Brennendes Gebäude(Bereich 6 “DC”) – not RttR! 16 Burning building(block 6 “DD”)/Brennendes Gebäude(Bereich 6 “DD”) – not RttR! 16 Coal shield(block 6 “D9”)/Kohleschild(Bereich 6 “D9”) – not RttR! 16 Water shield(block 6 “DA”)/Wasserschild(Bereich 6 “DA”) – not RttR! I now have started indexing and marking up stuff in the objects page that you haven’t seen before! It is possible to draw the pure black shadow bitmaps as they are, not as real shadows like you would see them usually drawn. Just wanted to say “Thanks” again! I started using these descriptors to create some training-like stuffs. My initial goal was getting rid of finite sources, and it was great help to be able to use this description, as the same structures appear in the game’s memory. The layers are easy to find (for eg. with cheat engine) if you look for the sequence ‘A4693200’, then use the 15 values spread on equal distances to each other. last 4 bits tells something about player occupation: 0x?0 means the human player, 0x?1 first CPU, 0x?2 second, 0x?4: third etc. (update: order may change in different game sessions) Think it has a worth of trying to find out other layers in-game. I successfully wrote an app which updates mining resources regularly, so making the resources and games infinite 🙂 Optional mode is, that I use my own pattern (I create 4×4 blocks tiles over the entire map, containing 2×2 of every resource, so you can place any mine at anywhere to be able to mine), the AI considers changes well. Note: If a mine is already told run out of resource, “refilling” surrounding tiles is not enough, you must destroy and rebuild the mine. However, if it keeps finding any resource, then works as long as you refresh the data. You can find slightly more up-to-date stuff at https://github.com/Merri/settlers2 (where it is also slightly easier to submit changes). Anotheer: Block 8 seems to be in-game layer too, it contains 0xFF where any guy stands. I think this is for movement logic, and is responsible for pile-up for eg. when attack is commenced with multiple militants, and they queue up, or civilians try to get through blocked road segment etc. Great stuff 🙂 I don’t have time to learn cheat engines or other direct memory tools so it is good to see some preanalyzed stuff before I get to looking at the savegames.